Amanda Liberman ’17, of Reading, Mass., has received Colgate’s 1819 Award, given annually to a student whose character, scholarship, sportsmanship, and service to others best exemplify the university’s spirit and the value of a liberal arts education. Nominations for Liberman noted her intellectual curiosity, compassion, and determination. “Amanda stands out as exactly the type of person who should be recognized — not only for her contributions while on campus, but for her unlimited potential to have an amazing and positive impact on the world, post-’gate,” one nominator said. Liberman, a molecular biology major with a minor in Russian and Eurasian studies, has served as a French tutor with the Upstate Institute foreign language program and as a verbal coach doing SAT prep with Let’s Get Ready! On campus, she volunteers for the Colgate Hunger Outreach Program and is actively involved with the Colgate Jewish Union and the pan-religious community in the Memorial Chapel basement. As a junior, Liberman was named Colgate’s first Beckman Scholar, through which she received 15 months of funding to support her molecular biology research. That research focused on developing a mathematical model for circadian rhythms and anxiety. She has also been recognized with the Max A. Shacknai Volunteerism Award and the Kingsford Prize for Public Speaking. Liberman recently earned a Fulbright English Teaching Assistantship, which begins after graduation and takes her to Kazakhstan. She was introduced to the country on an extended study course in the spring of her first year at Colgate, and she was fascinated by it. Her quest to return led her to apply for multiple fellowships that could get her there. 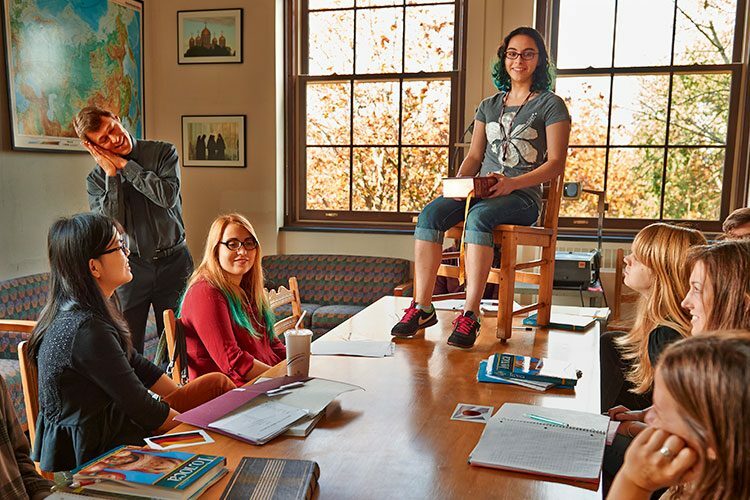 national fellowships and scholarships at Colgate.